The photo is from Michael Winkler’s major site-specific project currently being developed on Ministers Hill in Bridgton, Maine. 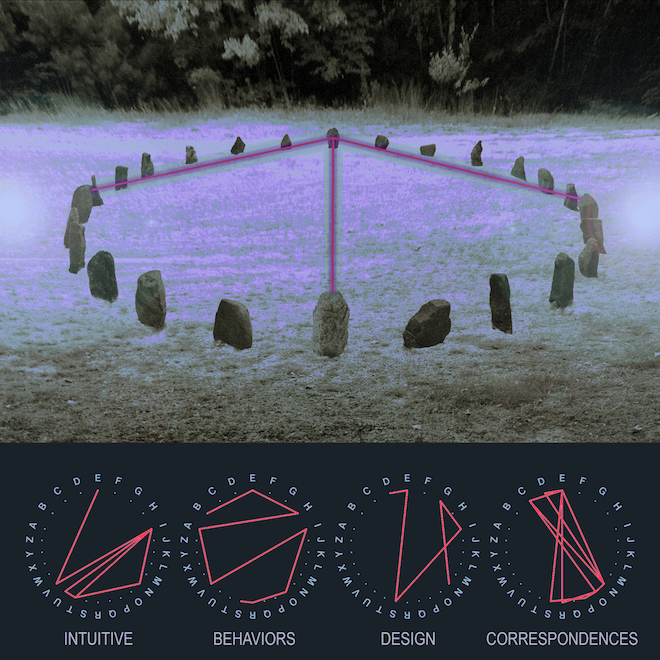 The project uses principles of ancient geometry to reveal a synchronicity which reappears, not only in the external environment of Nature’s systems and structures, but also in patterns of human awareness unintentionally carried into the signs of language (Henge-Lab.com/about). As a visual/conceptual artist for over 35 years, he has been engaged in an ongoing exploration of the imagery and implications of a process-based transformation of language. His project reveals an unexpected patterning hidden in the signs for written words—the imagery is created by mapping the spelling of words into a uniquely designed alphabetic circle (he wrote: “The letter-sequencing of spelling constitutes a patterning of intuitively formulated manifestations of meaning; the patterning arises from intuitive choices made by the collective awareness of our cultural ancestors”). The project has attracted interest both within and outside the international art community—it was featured in the landmark anthology “Imagining Language” in the company of work by authors such as James Joyce, Victor Hugo, and Louis Braille (published by MIT Press; Ed. Rasula & McCaffery). His work is collected by major museums as well as prominent art and literary libraries—major collections are housed at: The Museum of Modern Art, Brooklyn Museum, Yale, Stanford, University of Chicago, and the University of Pennsylvania (U. of P. presented a 22 year survey at its Rosenwald Gallery in 2004). Works from the project have also been exhibited at: Museum of Contemporary Art, Chicago; Contemporary Arts Museum, Houston; Nexus Contemporary Art Center, Atlanta; Kassel Art Museum, Germany and other major art institutions in the U.S. and Europe. His awards include fellowships from the National Endowment for the Arts and the Penn Council on the Arts, a LINE Book Award, and a Special Members Award from the American Society of Composers, Authors, and Publishers.